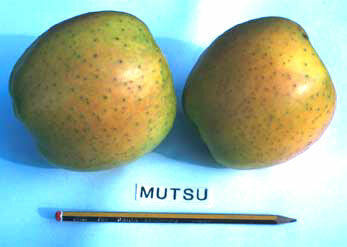 Golden Delicious × Indo, Aomori Experiment Station, Japan, 1930. Very vigorous, spreading, spurs freely. Susceptible to scab, moderately resistant to mildew. Delicious, Bonza, Fuji. Triploid variety so will not reciprocate with pollen for pollinator variety. Yellow-green, with slight blush, more russet-resistant than Golden Delicious. Dry, creamy flesh, crisp and juicy, some acid, with very good flavour.